What is the best carport you can buy in 2019? That’s exactly what we will look into today. From all steel builds, to canopy covered frames, those with side walls and guttering and simpler, portable options without. We’ve selected a range of carports to give you the comprehensive low down on what you should buy. For our findings at a glance, just head to the table below. For a short buyer’s guide, plus in depth reviews on each of our top 5 picks, keep on reading. If you love your ride, you should care about its storage. A good way to keep your car safe from the effects of weather and other conditions that may damage it is to buy a carport. As we mentioned above, carports can range from simple canopies with stabilizers that offer a cool shade for your car, to fully installed steel covered builds designed to last for decades. However, that being said all carports do the same thing; they protect your vehicle from the elements, shielding your car from the scorching sun, or damaging rain and snow. There are very many carports in the market manufactured and sold by different companies. They also come with different features and prices. However, for most car owners, shopping for the best carport can be quite confusing; especially for first-time buyers. For this reason, we have decided to review the best carports that should top your wish list. But before that, we will discuss some of the general considerations you should have before buying a carport. Generally, go for a carport that has pre-cut and pre-drilled parts for easy installation. It will be very hard and costly when you buy a carport that needs a professional installer. Carports come in different sizes. So, when shopping for them, make sure you have your clearly set requirements so that you don’t end up purchasing a carport that covers half your car. You can even buy carports designed for two vehicle. If you have the space and the need, this can be a very wise option. The cover of a carport really matters especially in terms of durability. Make sure you go for a carport that has been crafted with a durable cover preferably, one that has been made from polyethylene or polycarbonate material. The most hard-wearing carports are made from steel. If you live in an area with high snow fall, this is the direction you should take. Even the strongest canopy covered carport is likely to buckle under heavy snow. With a strong frame, you are guaranteed a solid carport that will last for long and resist even harsh winds. A good carport frame should be made from galvanized steel and must be rust and corrosion resistant. When it comes to price, make sure you get value for your money. It is imperative that you do some window shopping to at least have a rough idea of what features you should expect depending on your budget. Having covered all the above, we will go straight to our reviews of the top 5 best carports in 2019. This carport is the ultimate way to shield your car from harsh weather and even dust. Besides, you can use it to hold outdoor events. One great thing about this carport is that it is large enough to accommodate two cars. Built with high-grade materials, this carport is ideal for multiple car owners or those who drive large vehicles. Here is the review of the Regular Style 18′ x 21′ Two-Car Carport. This carport is manufactured by Eagle Carports, a growing company that manufactures car shades and garages, and are based in the USA. Unlike many carports in this range, the Regular Style 18′ x 21′ is large enough to accommodate two cars wholly. This makes it a great purchase for anyone who has more than one car, (or has regular visitors). This carport has been built using American-made steel frames and heavy duty roof panels. Its design is also open to customization, unlike many similar products. This carport boasts of a 29-gauge horizontal roof. 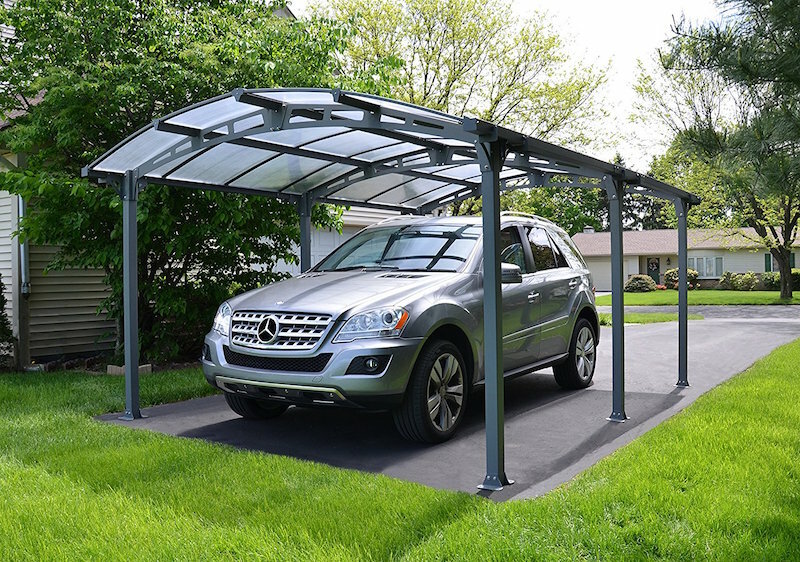 With this carport, your car is completely shielded from the scorching sun and rain. However, it doesn’t have sidewalls thus making it just an average carport, but durable. (b) The large dimensions obviously take up a lot of space. Even though this carport just sounds like an average carport, its size is impressive. It can accommodate up to two cars which are a great thing for such a low-budget carport. Besides, it is customizable meaning you can add a few things for the best experience. The size, price and materials used make this our top pick all steel carport option. Highly recommended. The King Canopy is an easy installation carport that can also serve different purposes and needs besides protecting your car. This carport comes with 8 legs for maximum stability and has been joined by strong and sturdy frames for reinforcing its sturdiness on the ground and most importantly, for durability. It is easily detachable and assembly is less intensive thus making it a great carport as well as a canopy for outdoor events. Here is a dissection of the King Canopy Hercules. The Hercules HC1020PC is manufactured and distributed by King Canopy. This company is known for its high-quality canopies and garages, event booths, umbrellas and so on. Since 1940, their products have never disappointed and that’s why it remains a household name in many markets. This carport measures 10 feet by 20 feet. This is quite enough for an average car as well as gardening equipment. This carport sports a unique A-Frame design that gives it more room on the roof. Besides, it makes it more strong and sturdy. To guarantee sturdiness, this carport has been engineered with 2-inch white powder-coated frames that have been further pre-cut and drilled for easy assembly. It also boasts of 8 stabilizers for reinforced sturdiness. One unique feature of the King Canopy Hercules is the patented Heavy Duty Polyethylene cover. This cover features a fitted white drawstring design for easy installation as well as detaching. Furthermore, the cover has UV inhibitors and is fire and water resistant. Measures 10 x 20 Ft.
(b) The 1 Year Limited Warranty is a bit tight compared to the Eagle, 20 year one. Even though it has no sidewalls, it is a great purchase considering the friendly price tag, and is our number one canopy covered carport choice. Another ideal carport you need to consider is the Abba Patio Heavy Duty Carport with Sidewalls. This car shade is very versatile as you can still use it for other shade needs apart from just storing your vehicle. It can come in handy during outdoor events and can also act as a horse shade. It comes with 8 stabilizers and a high-quality polyethylene cover. It is easy to set it up and can be installed on any surface. Here is a review of this carport from Abba Patio Heavy Duty Carport with Sidewalls. Abba Patio is a popular company that is known for offering gardening and backyard solutions. Its product portfolio includes outdoor umbrellas, canopies and gazebos, patio furniture and so on. Abba Patio products are known to be of high-quality and affordable. This carport sports a spacious design making it ideal for auto storage as well as outdoor events. It measures 10 by 20 feet and can be erected on any surface. This makes it a versatile shade for storage as well as hosting outdoor events. To ensure stability and sturdiness, this carport comes with powder-coated steel frames that are rust & corrosion resistant. When it comes to stabilizers, it has 8 strong stabilizers that give the canopy resistance even in strong winds. The Abba Patio Domain Carport has a high-quality polyethylene cover that covers the top as well as sidewalls. This cover shields your vehicle from the damaging effects of scorching sun and other adverse conditions. There are two front-zipped flaps for easy opening and closing. Measures 10 x 20 x 9.4 ft. The Abba Patio APGP36PEB 10 x 20 ft. Heavy Duty Domain Carport is a unique and highly versatile carport that can also host outdoor events. Its cover is made from high-quality polyethylene material and covers even sidewalls. If you are looking for versatility, this really does fit the bill. It is marred by a less than hard-wearing construction however. If you are looking for an easy-to-set up garage, then this carport from ShelterLogic will be your best purchase. Besides, it has been crafted using high-grade materials for maximum car protection and most importantly, for durability. It is ideal for a range of autos including cars, ATVs, trailers, gardening equipment and other bulk storage needs. Here is a review of the ShelterLogic 1020 AutoShelter. This carport has been manufactured by ShelterLogic, a renowned brand in the manufacture and distribution of shades, shelters, and other storage products. With over 50 years in business, this company is known for its innovative and high-quality products including the ShelterLogic 1020 AutoShelter. The ShelterLogic AutoShelter measures 10 by 20 feet making it a great carport for several automobiles ranging from small ATVs to tractors. This carport comes with a waterproof and UV-treated advanced engineered triple-layer ripstop polyethylene cover. It has further been reinforced with fade blockers, anti-aging, and anti-fungal properties to with stand harsh weather conditions. The ShelterLogic 62680 Instant Garage also comes with strong stabilizers for easy installation and most importantly, to give the carport the sturdiness it requires. It comes with Patented ShelterLock® stabilizers that guarantee solidness and stability. The all-steel frames measure 1-3/8 in. / 3,1 cm and have been bonded using thermoset premium powder coating to shield them from peeling, chipping, corrosion and rust. Nothing can be more stressful when winds keep blowing away the cover. One advantage of the ShelterLogic 1020 is the Ratchet Tite cover tensioning system and Easy Slide Cross Rail system that keeps the cover tight and neat always. Measures 10 x 20 x 8 ft. The ShelterLogic AutoShelter 62680 Carport is a great vehicle storage option. Even though its price tag is quite high, it is worth every penny. It is stable, strong and long lasting compared to may carports out there. Besides, it is easy to set it up and provided great protection. For simplicity alone, this is a worthy entry in our top 5 carport review round up. The Palram Arcadia 5000 is another great carport for those looking for an easy installation carport. It comes with pre-cut and pre-drilled parts and only requires two people for assembly. Its roof panels are unbreakable and the UV protected cover material is effective in protecting your car comprehensively. This carport is very versatile and can be used for other purposes for example, as a patio cover for hot tubs, outdoor events and so much more. Here is a review of this great carport from Palram. The Arcadia 5000 is manufactured and distributed by Palram, an established company that manufactures a wide range of products from building materials to specialty products. All its products are designed and engineered using the latest technologies for efficiency and durability, the Arcadia 5000 is no exception. Even though this carport is not as large as the others, it is still impressively spacious. It measures 12 Ft. x 16.5 Ft. Installing a carport is quite a challenge but not with the Arcadia 5000. This carport comes with ready parts that require only two people to install. You don’t need any carpentry skills or tools. To ensure your car shade lasts long and the carport resists strong winds, the frames have to be strong. For this reason, Palram brings on board powder-coated aluminum and galvanized steel frames that guarantee sturdiness. Besides, these frames are rust and corrosion resistant to ensure your carport lasts for many years even in harsh weather conditions. Unlike many carports that use the lighter polyethylene material, Palram used high-quality 6mm polycarbonate material which has been reinforced to make it incredibly strong. Furthermore, this material is 100% UV protected thus shielding your car from harmful sun rays that might cause the paint to fade. The only shortcoming of this carport is that it doesn’t have sidewalls meaning your car will be exposed when the sun is at an acute angle. During the rainy season, you don’t need to worry about rain water stalling at the top. This is because Palram designed this carport with integrated gutters for enhancing drainage. You can take advantage of these gutters and channel rain water for home use, or at least, for washing your car. Another great addition to this carport is the anchoring and foot pads that secure the carport tightly to the ground. It also enables home owners to move the structure with ease. Measures 12 x 16.5 Ft. Even though this carport has no sidewalls, it can still be a great purchase for anyone looking for a multi-purpose and durable carport. Besides protecting your car, you can take advantage of the gutters to harvest rain water for home use. If you want a lasting solution, then this is one of the best carports you can buy.